Plum spice cake, your favorite winter wonderland treat. 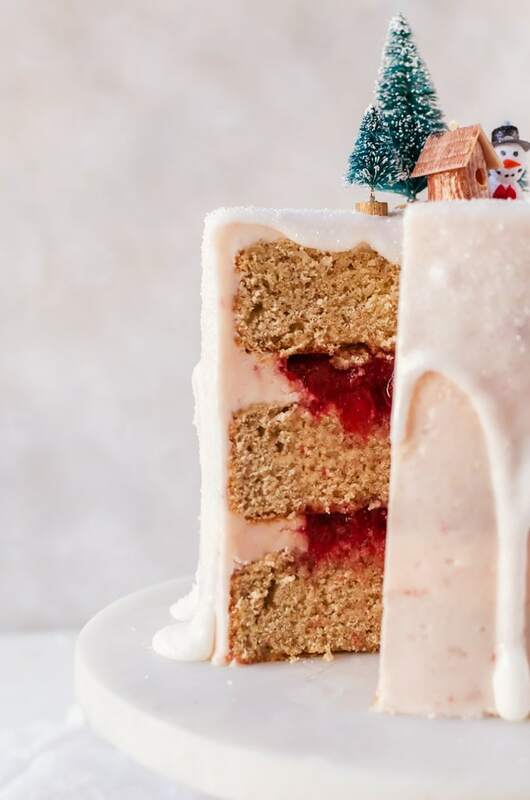 It’s a lightly spiced cake is made with sweet plum preserves, a smooth vanilla plum buttercream and topped with an irresistible white chocolate drizzle. 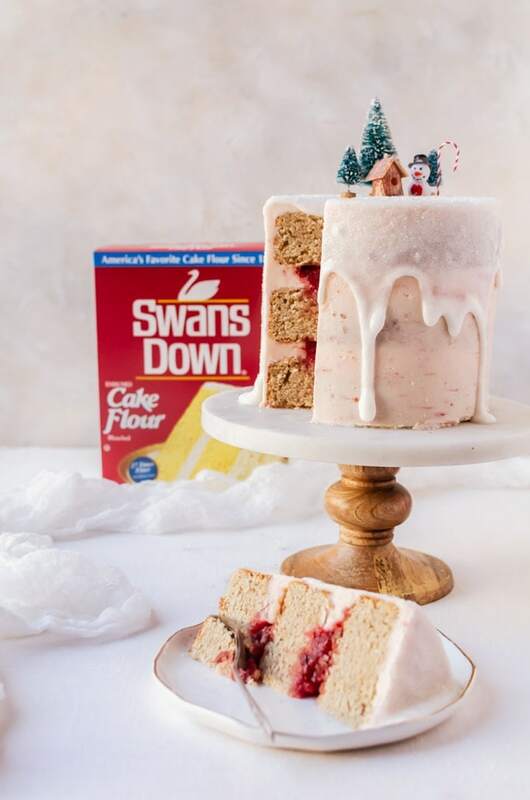 It is light and moist thanks to Swans Down Cake Flour, my favorite cake flour and sponsor of this post. There is nothing quite as exciting as the holidays. I adore everything about it. Staying cozy inside with a mug of hot chocolate and cookies. Decorating every inch of the house with lights and evergreen. Crossing off gifts from each person’s Christmas list. I basically become a mini Mrs. Clause, but in a way that is only mildly annoying. I say mildly because I do sing. And not well. Not well at all. But I do know when to stop. Sorta. One of my favorite Christmas traditions is to make a cake for the holidays. This year will be this plum spice cake. Sure, I bake cookies and pies, but I always do a holiday cake each year without fail. It’s the one tradition I look forward to the most. I like to make one for Christmas when everyone is tired of cookies, but still wants something sweet at the end of our Christmas dinner. 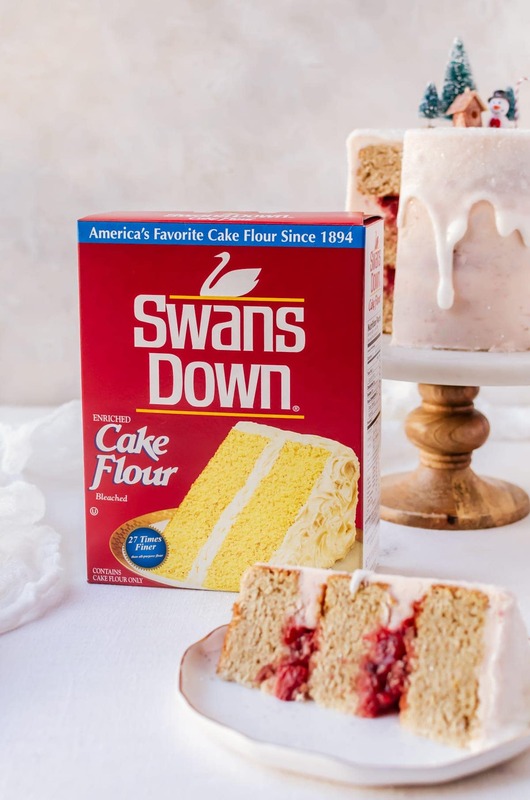 Most of the time, I use regular unbleached all-purpose flour, but for any special recipes I make for my family and friends, I always go for cake flour, and for the past four years, I’ve been reaching for Swans Down Cake Flour specifically. The reason I use Swans Down Cake Flour is because it consistently gives me a beautiful crumb on my cakes and leaves them light, delicate, and moist. I always get consistently amazing results and the best compliments. So, if I want to make an impression, like with a stunning plum spice cake, I always go for their flour immediately. 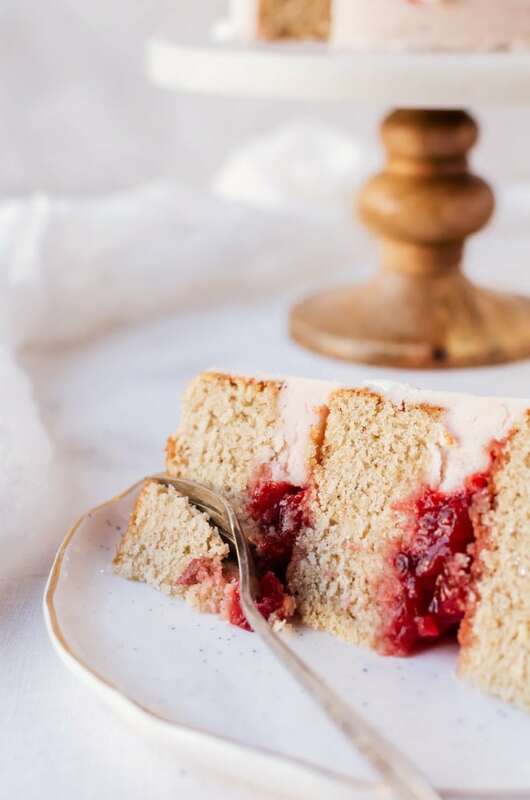 I decided on a plum spice cake because it reminds me of sugar plums, which of course, makes me think of The Nutcracker and the “Dance of the Sugar Plum Fairy.” It is a lightly spiced cake filled with flavors of cinnamon, ginger, and cardamom plus a note of cracked black pepper. 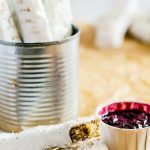 These wonderfully balanced flavors are paired with a sweet plum preserve filling and surrounded by a simple American buttercream lightly flavored with plum. 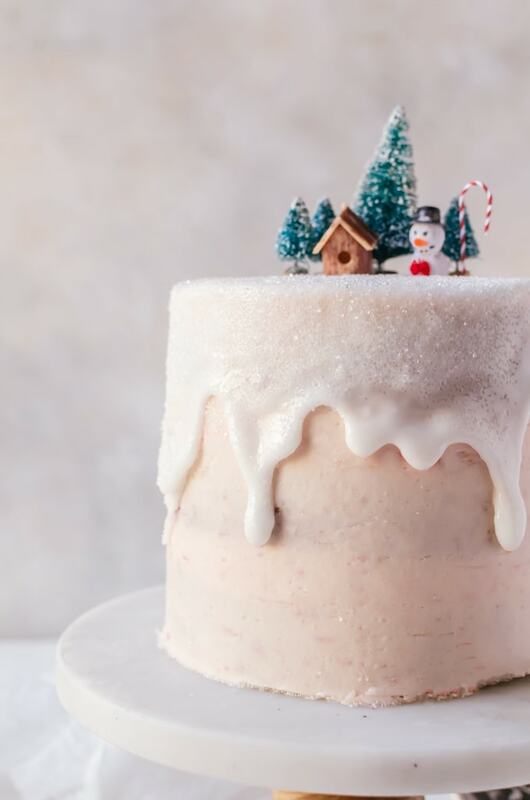 It is then topped with a white chocolate drizzle and finished with white sparkles to complete the winter wonderland look. 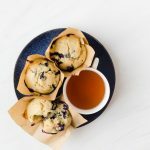 It will be perfect with a mug of coffee or tea, or even some hot chocolate. Make the cake. Preheat the oven to 350 degrees F. Grease and flour 3 6-inch baking pans that are 3 inches deep. Set aside. In a medium bowl, mix together the flour, baking powder, spices, and salt together and set aside. In a mixer, add the butter and sugar together and beat until light in color and fluffy. Add the vanilla and then beat in the eggs one at a time until well combined. Alternate adding the flour mixture and the milk to the mixer. Begin and end with the flour, which should be added in three additions, while the milk is added in two additions. Pour the batter into the baking pans and smooth out the tops. Bake for 25 – 30 minutes, or until a toothpick inserted in the middle comes out clean. Allow to cool in the baking pans for 10 minutes, then run a knife between the edges of the pan and the cake and then turn out the cake onto a wire rack to cool to room temperature. Once cooled, tightly wrap in plastic wrap and freeze until needed. Make the filling. Pit and dice the plums. Add all the ingredients into a small saucepan and heat on medium high until the liquid is thick. Cool completely. Make the frosting, Beat the butter until it is smooth and creamy. Add the powdered sugar one cup at a time and beat well. Add in the plum syrup, vanilla, and salt together until well-combined. 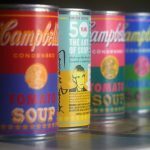 Add in the heavy cream one tablespoon at a time until you reach the consistency you desire. Make the drizzle. Add the white chocolate and heavy cream to a microwave-safe bowl. Heat for 30 seconds on 50% power in the microwave, then mix. Repeat until the white chocolate is melted. Stir in the coconut oil. Allow to cool completely. Assemble the cake. Cut off the domed tops of the cakes. Create a ring of frosting around the edges of two of the cake layers. Fill with the plum filling. Top these layers on top of one another, then top with the plain cake layer. Frost the cake with the remaining frosting, then chill in the refrigerator for at least one hour. Once chilled, pour the drizzle over the top of the cake and gently push the drizzle over the edges and allow it to drizzle down. 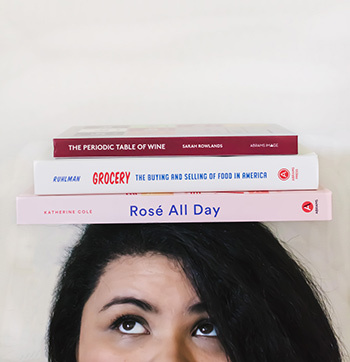 Decorate the top as desired. WOW!! What a gorgeous cake. Loved watching how you made in on your Insta stories. Gorgeous photos, as always. This cake is absolutely gorgeous! 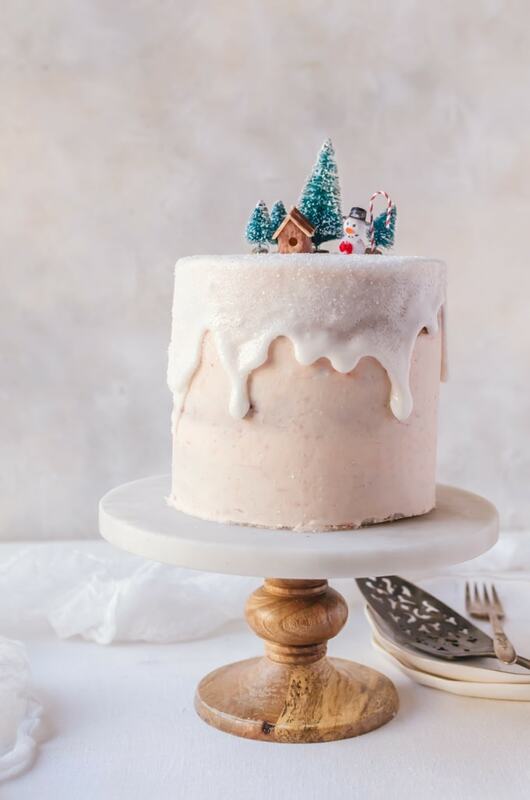 It really is the perfect winter cake! The cake itself is a showstopper – love the layers inside!